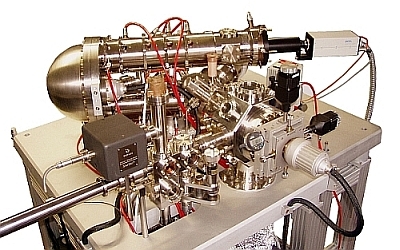 The SPELEEM is a LEEM III equipped with an imaging energy analyzer and has become a standard instrument present in many synchrotron radiation facilities and research laboratories. The combination of a LEEM with an imaging energy analyzer is the key to obtaining real time characterization of both local chemical and structural information. Furthermore, using short light pulses time resolution down to the femto-second range can be achieved. The instrument is ideal for direct real-time imaging of crystal surfaces, for dynamic studies of growth, decomposition, melting, phase transition processes, diffusion on surfaces and for many other scientific surface processes. The system is simple to use and with its advanced computer control, easy to align enabling users to make the most out of their research time. Step contrast on Si(1 1 1) (7 x 7). FoV 5 µm at 45 eV.